Replacing a small window with a larger one may not be in your budget, but there are ways to make it look bigger. Several ways will fool the eye into believing the window is bigger than it actually is. These options are suitable for most budgets and are a simple solution for small windows. Make your small windows work for you. 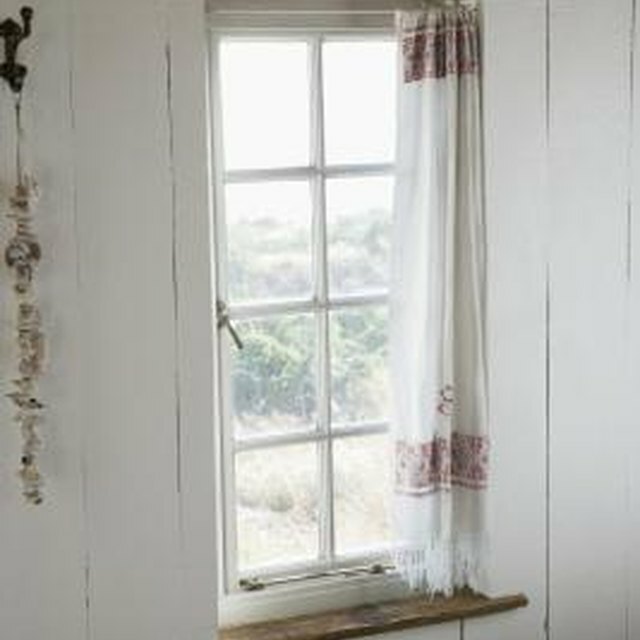 A window will appear wider when the curtain rod is extended past the window frame. Mount the rod at an equal distance on both sides of the window frame. The distance will vary depending on your personal preference, but 6 to 12 inches will add an extra 1 to 2 feet to the window width. When the curtains are opened, do not go past the frame and you'll create the illusion of a wider window. Choose rods that are small in diameter and avoid rods that are thick and ornate. Installing blinds inside the window frame creates a smooth transition between the wall and the window. While providing privacy when needed, an open blind allows for as much sunlight as you would like. A twist of the baton makes adjusting the amount of sunlight entering the room easy. Let the light shine in with sheer curtains in a light color. Sheer curtains still provide moderate privacy if the width of the curtain is at least double the window width. The folds that form in the curtain as it hangs from the rod will make the curtain appear thicker, but sunlight will still filter through. Stay away from heavy curtains, loud patterns and bright colors that will dwarf a window. Create an illusion of a larger space by placing two or three small mirrors along both sides of the window. The length of the window will dictate the size and number of mirrors you can use. Use the mirrors when a blind is the only window treatment. Give the appearance of a larger window with cafe curtains. Use the trick of placing the rods outside the window frame to make the window look larger. Generally the bottom rod is placed near the center of the length of the window; however, to make the window appear larger, install the rod lower on the frame. Keep the bottom curtain closed to complete the illusion.